1st Lt. E. Blair Patton, son of Mr. and Mrs. R. B. Patton, graduated from Tipton High School and Draughons Business College; husband of the former Mary Crocker. 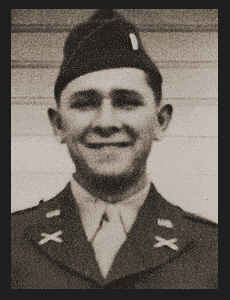 Entered Army in Aug., 1942, trained in Camp Roberts, Cal., Ft. Sill, Okla., Camp McCoy, Wis., Ft. Riley, Kan., Ft. Kno, Ky., Ft. Bragg, N. C.; served in Germany, France, Belgium, and Luxembourg; is now on duty in France. Awarded Bronze Star, ETO Ribbon with four Batlte Stars, Good Conduct Medal.